While trying to move a college-aged daughter out of her Somerville apartment, we encountered some mechanical difficulties with a Uhaul van and were informed by Uhaul that we were going to have the van (packed with my daughter's furniture and belongings) towed to our home in Connecticut. While we had to wait abit for the tow to come, we were greeted by an employee of Export Towing named Matt who was very courteous and professional. He was very reassuring that her belongings were in safe hands and delivered the van at the time he said he would. Even as he left our house, after the van was unloaded, and was informed by Uhaul to tow the van back to Massachusetts his professionalism and courtesy never waivered. I know we often hear negativity when people do not perform their jobs well. I just wanted to commend someone who did his job very well. Thank you very much Matt. I made a trip from the Kingman, AZ area to purchase a mattress from a private party in Las Vegas. We tried to fit the mattress inside my SUV without success, so the next, but less desirable option was to tie it on the luggage rack of my car. I found out after the fact that the type of rope used was not nearly adequate (more like straw, little did I realize)! The guy assured me that it was very secure, especially since he was very skilled at tying knots. The mattress held until we got just north of Henderson. It suddenly flew off the roof and landed behind me in the right hand lane of traffic. Thank goodness I drove a little further down the road to get out of the way of traffic, rather than stopping near or next to the mattress, which allowed traffic to go around on both sides. I found a safe place a little further down the road and stopped to figure out what to do. To make matters worse, I had a 12 yr. old granddaughter traveling with me! I was extremely panicked for many reasons: the great danger this posed for everyone, the fear that I would be cited in some way or charged a fee...being on my own puts me at a real disadvantage, and almost caused me to try and solve the problem all on my own, which could have really been a disaster--a terrible one. Indeed, I shudder to think of what could have happened, had I not had any where to turn...thank goodness I called for help, and that the 911 dispatcher comforted and assured me: "They will help you," she said confidently, which made me feel a whole lot better, even though I had no idea of who or what. She must have been aware of this program to suggest such a thing...as scary a thing as this mishap was to go thru, I'm thrilled to have stumbled across this kind of amazing service--one which was truly a life-saver (literally) for me! The patrol driver managed to retrieve the mattress without incident. He seemed very conscientious and on the ball. He first came up and asked me how far I had to travel, and being long distance, he wouldn't consider trying to place the mattress outside of the vehicle. Without hesitation, he was able to come up with a great solution to correct the problem by folding it in half (the seller and I had tried to fold it length-wise, which didn't work, but this way made it possible to fit in my vehicle). I caught on to his expertise and came up with the idea to use the rope to hold the mattress together as we lifted it into the car. This plan allowed me to be back on the road without running serious risks to myself or others--what a relief and a blessing!! I gave him a great big hug, as our hero of the day!! It's no wonder the thing flew off, since I discovered just how weak the rope was when I pulled on it to try and steer the mattress into the house...it immediately broke just from tugging on it slightly, and I flew across the porch into a pole (ouch!). I also discovered that I was dealing with a very dishonest seller, and that contrary to what I was led to believe, I did not purchase a cool gel mattress--something I needed to offset the extreme temps where my grandmother and I recently moved to. It's also a lot more used than he claimed-- at least by 3 yrs. according to the inside tag! So, on top of all the other hassle and grief, I overpaid and got taken advantage of financially....still, maybe it was worth all the trouble, since I feel very rewarded by discovering such a great program available that has provided such an invaluable service to me and my little one, who was also badly shaken by such a traumatic and harrowing experience. My humblest gratitude and thanks for those who made this possible! It couldn't have gone more smoothly, once help arrived! Thank you for sparing our little family from a much worse fate...we are forever in your debt! We all enjoyed working with United Road Towing, Inc. It's a very rewarding experience when two professional companies work together to achieve one main goal during a disaster. Disaster response is a very crucial event, and experience counts when providing that type of service. We want you to know that Big Daddy's Towing & Recovery is looking forward to building a long term relationship. Working with United Road Towing was as smooth as a process you could ask for. The constant communication bridge between our companies made daily operations efficient and effective. We were kept informed and our employees were treated with respect and professionalism. From dispatching the calls, to the payment process, United Road Towing was prompt in every aspect. Our expectations were exceeded working with United Road owing. We look forward to continuing our relationship with United Road Towing. Thank you so much Kevin! You saved me! You were extremely nice and professional. First my husband and I would like to thank you for having the freeway service patrol out and about on our highways. We had never known about them before. Thank you, that is such a blessing. Second, Richard on Route PsP3 north I-15 and mile marker 3 was amazing. We can't even say how grateful we are for how kind Richard was. We lost our whole tire on the rear drivers side. He pulled up about two minutes after we pulled over. We got the spare out and he was able to change the tire in no time like he was on a pit crew. I'm so grateful because it would have taken my husband much longer with our jack and he was on the freeway side of the car and it could have been so dangerous. What a wonderful blessing. Richard even followed us for a while until we saw someone on the side of the road with the same problem we had. Thank you, thank you. He would not allow us to give him a tip but we wanted you to know he is amazing. - URT/Quality Towing currently operates the Nevada DOT - Freeway Service Patrol and for more info contact us at (702) 946-1975. Thank you for this service. Thank you for Richard! I am writing to express my gratitude to Dan who assisted me today when my car stopped running while on I15near the Tropicana exit at around 6:30 pm. It was a very dangerous part of the highway, and I was afraid the an approaching car would hit me. I had just picked my 2008 Saturn up that morning from the auto shop where they had replace a cracked fuel pump for $1500. That evening, I was driving to the airport to pick up my 8 year old who was flying by himself. I was required to meet him at the gate at 7:20 pm, and I did not have a backup person to do this. When my car stalled, I was scared and devastated. However, Dan appeared two minutes after I stalled and placed his car in a protective position. He was very friendly, and it was a huge relief that he could protect me and my car to give me time to call for help. But he did more than just that. Once I told him what had happened, and showed him my repair receipt from that morning, he looked under my hood, and then noticed gas leaking under my car. He looked under the car and saw that the fuel line had come disconnected because it had not been securely reconnected by the auto shop after they had repaired my fuel tank. After he reconnected the line, my car started right up. This all took less than 5 minutes! Although he advised me out of safety that I should have my car towed, I was so worried about my 8 year old at the airport, that I drove straight there and arrived before his plane landed. I cannot begin to describe how grateful I am for Dan's help. I am so glad that you have people like Dan to help so quickly and with such kindness. Today would have been a complete disaster without Dan. Not only did he keep me and my car safe, but this in turn helped with the safety of my 8 year old for which I will be eternally grateful. Thanks Dan - I wish you and yours the best!! 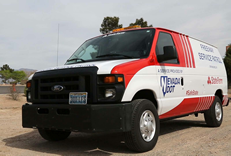 - URT/Quality Towing currently operates the Nevada DOT - Freeway Service Patrol and for more info contact us at (702) 946-1975.